CURLING TODAY: World Champions welcomed home! A goodly crowd of friends, family, supporters and onlookers – some of whom had travelled down from Blair Atholl – met the two Scottish teams on their arrival back on Scottish soil after the World Junior Curling Championships in Ostersund. 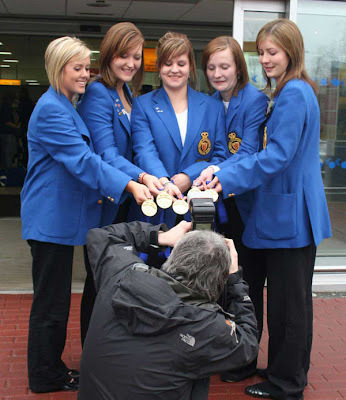 First to appear through the international arrivals gate were the support staff followed by the men’s team. The boys were obviously disappointed but upbeat. They are a talented group of curlers and all will doubtless be back on the world stage in the future. Then came the moment that we had all been waiting for, the return of the World Champion Junior Ladies team! Flags were waved and songs were sung – indeed the odd tear was shed as the girls stepped rather sheepishly into the well-deserved limelight. STV were there to cover their arrival and Annette Holmes of the RCCC had also organised for the Daily Mail to be there to interview the team. All were tired after a long early-morning flight home from Ostersund via Copenhagen, but all were in good spirits and put up with the inevitable press and photographer interest to the manor born, before splitting up and heading to their respective homes. Thanks to Robin Copland for this report and the pics! Top: A professional at work 'Show me the medals!' 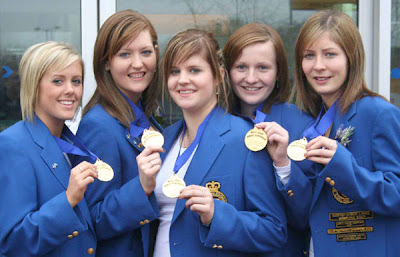 Above: Kay Adams, Sarah Macintyre, Vicki Adams, Kerry Barr and Eve Muirhead. Photographs by Robin Copland.